There’s something about Da Lat with its mountain air, brown cafes, and leafy paths that makes it a perfect place to form a band. 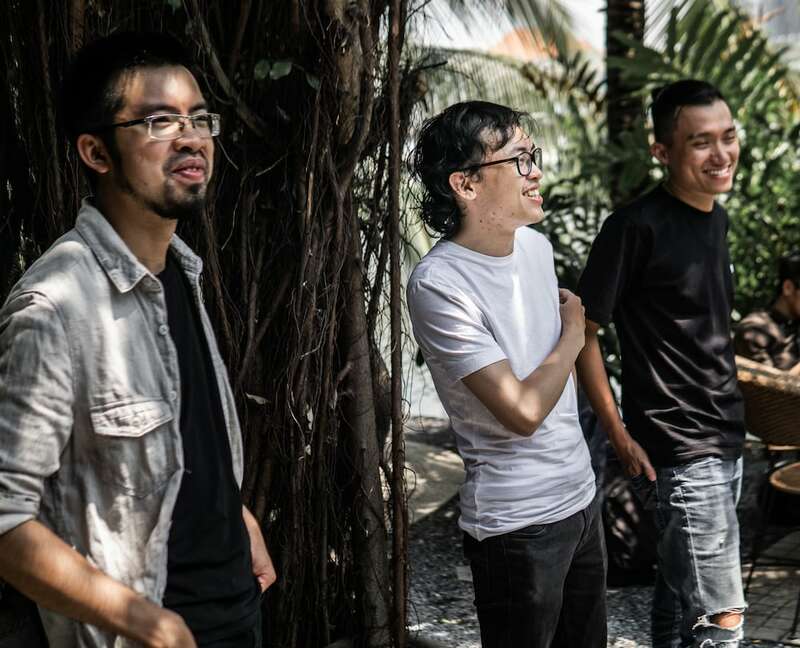 “I’m definitely more emotional when I’m in Da Lat,” Ca Hoi Hoang’s Da Lat-born guitarist Nguyen Thanh Minh agrees, “I feel like the space and the slow pace of life there settle down my mind.” But the indie band’s lead singer, who is also from Da Lat, isn’t convinced. “Musicians aren’t plants,” Luke Nguyen Viet Thanh interrupts. “I think the important thing is the talent and not the temperature,” he laughs. Ca Hoi Hoang, whose name means “Wild Salmon,” developed around the two musicians who first met in high school. And the name “Ca Hoi Hoang” is intended to conjure up images of untamed nature. “Salmon swim upstream against the current,” Minh elaborates, “and there they spawn…and then they die,” he shrugs. Ca Hoi Hoang with [from left to right] Nguyen Thanh Minh, Luke Nguyen Viet Thanh, and Bui Khac Dat. 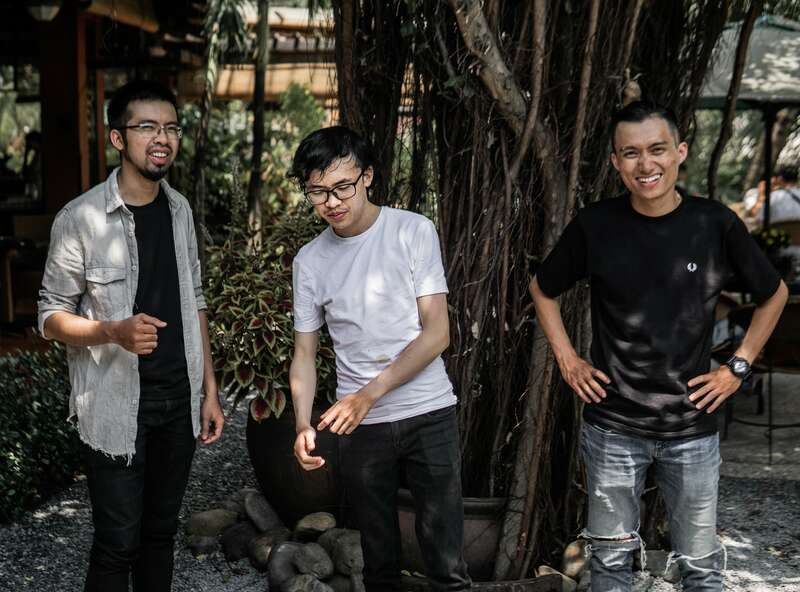 The only current member not from Da Lat is bass player Bui Khac Dat, who’s from Gia Lai 400 kilometers further north into Vietnam’s Central Highlands. 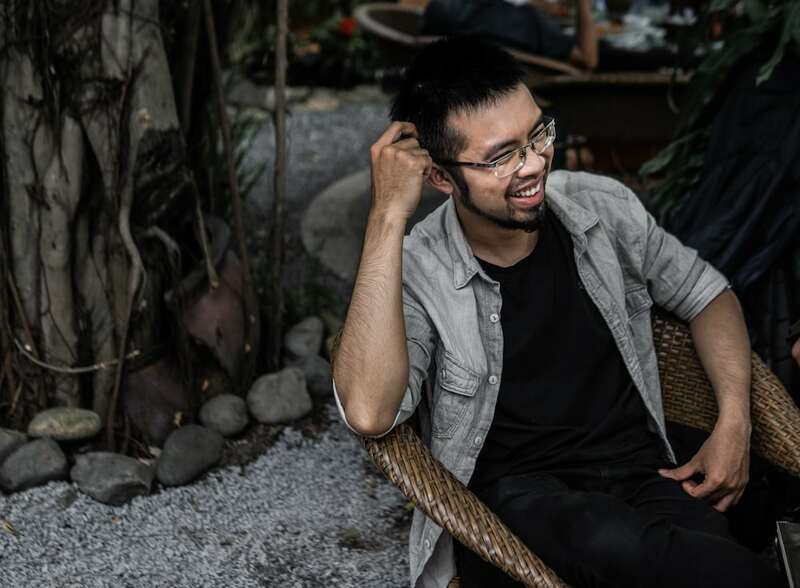 “Luke is our composer and creative energy and although he’s always having ideas and joking around a lot, he takes the music very seriously and he isn’t easily satisfied,” Nguyen Thanh Minh explains. “And Dat, our bass player, is a mix of opposing colors,” he adds. 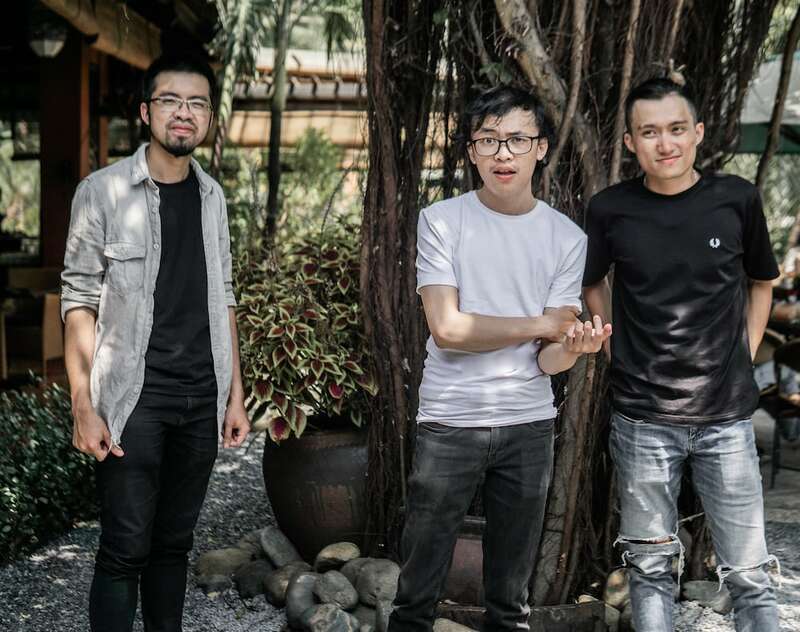 The three-piece band—they recently parted ways with guitarist Le Dang Hieu—are based in Saigon. That is when they’re not touring and playing sold-out shows like the two they recently held at Hanoi Rock City. They’re still coming to terms with the adulation they’re starting to get at their concerts. “The audience were singing along,” Nguyen Thanh Minh remembers wide eyed. “And there’s that moment when the lights go out and you climb the stairs to the stage…” Luke Nguyen Viet Thanh trails off. Your most recent music video for “4s” was animated by artist Triet Le. How did the project happen? And how do you feel about the finished video? Luke Nguyen Viet Thanh: Triet Le approached us. We visited his website and liked all of his work and so we were immediately excited by the idea…then “4s” happened. The finished video is touching and mind-blowing. Nguyen Thanh Minh: Yes, Triet Le sent us an email saying that he would like to collaborate on a music video. First, we chose the track “Lap Di Lap Lai” but then we changed to “4s” because we felt it suited Triet Le’s style more…and it does. “I’m definitely more emotional when I’m in Da Lat,” Nguyen Thanh Minh, Ca Hoi Hoang’s Da Lat-born guitarist explains. We met with Triet Le at a coffee shop to talk more which built a bond, and three months later we have the video. I almost cried the first time I watched it, even though I have never had the same experience as the character in the video. Maybe I’m touched because my idea was realized as this remarkably emotional story. Its message is to always appreciate and cherish what we have in life. Who would be your dream music video director and what would the finished video look like? Luke Nguyen Viet Thanh: Christopher Nolan. Imagine what he could do with a four or five minute music video—it could be so awesome with marvelously cinematic scenes and an unpredictable twist at the end. And I would love to have Jack White to be a main character in my absence. Ca Hoi Hoang have also collaborated with rapper Datmaniac. How would you describe the track “Ngày Nào”? And what do you think indie music and rap music have to learn from each other? Nguyen Thanh Minh: We wrote and started recording “Ngày Nào” a long time ago…but we never completed it. Then Datmaniac came in and changed the track from the original idea. Luke Nguyen Viet Thanh: The chorus, hook, and melody were all there. Then Datmaniac added his lines. We share a creative, playful approach to lyrics with Dat—in fact we’ve learned a lot from hip hop in general; the wording and the energy it has. I feel rappers appreciate the energy of a live band too, so there should be more collaborations between these two scenes. Is being in a guitar band still relevant? How do you manage to do interesting things in such a well-developed genre? Luke Nguyen Viet Thanh: You can do a billion things with just guitars. Trends don’t really figure in our creative process. We just develop ideas with the instruments we have at hand. 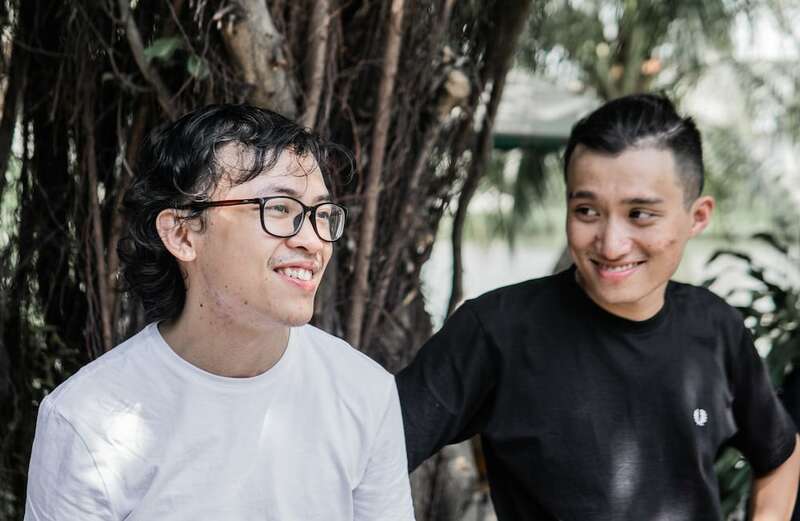 Nguyen Thanh Minh: I think to be truly relevant an indie band needs each of its members to be talented in the role that they play—I’m thinking of bands like Coldplay and The 1975. Each of us in Ca Hoi Hoang is practicing and learning new things all the time. Those skills feed into our work and so the band’s music benefits. What’s your writing process like? Do you write all the time, or do you set time aside to focus on your songwriting? Luke Nguyen Viet Thanh: I’m constantly having ideas—it could be the melody first, or the idea for a lyric might come first which I note down in a notebook or using my iPhone. Lyrics have a habit of appearing in my mind when I’m riding my motorbike. Sometimes I’ve even had to stop and pull over to write the idea down. Nguyen Thanh Minh: And we practice twice per week. We used to use a space on Le Van Sy, in District 3, not far from Red Door cafe, which we used as the backdrop for a video shoot—although we blacked everything out, so you wouldn’t really know. Now, as we start working on the new album we plan to step up the number of practice sessions we have. How wild does being in Ca Hoi Hoang get? Nguyen Thanh Minh: We’re well behaved when we’re on tour. I don’t think we buy into the rock star myth of getting wasted before a show—in fact, we feel an obligation to the fans to give them a good performance. Luke Nguyen Viet Thanh: Being in a band means we’re away alot, both physically and spiritually. It’s hard to envision long term relationships when life’s like this. How do you think tastes in music are changing in Vietnam? Luke Nguyen Viet Thanh: The internet is a powerful force that’s giving listeners lots of musical options which they can dip into and test out. Nguyen Thanh Minh: Currently, I think styles of music in Vietnam are diversifying dramatically. As I see it, young people prefer songs composed and performed by young artists, which is helping new trends to evolve. And social media is giving them more chance to interact with their favourite types of music. And the relationship is two-way—they can easily share their feelings about the music they hear. Bui Khac Dat: In my opinion, people are gradually preferring music that has depth and quality more than simply being pleasurable to the ears. Perhaps the music industry is saturated and that’s why audiences—including the audience in Vietnam—are becoming more selective and discerning. If someone’s new to your band, what’s the one song you’d play them as an introduction? Luke Nguyen Viet Thanh: I’d opt for a random playlist of our songs—I feel they’re all good in their own way. Nguyen Thanh Minh: I would choose “Tang thuong 102.” I love this one the most out of all of our tracks. Besides yourselves, who would be on the lineup of your dream festival? And where would the festival be held? Luke Nguyen Viet Thanh: Mine would be somewhere in Nha Trang, by the beach, with Snow Patrol as headliners. 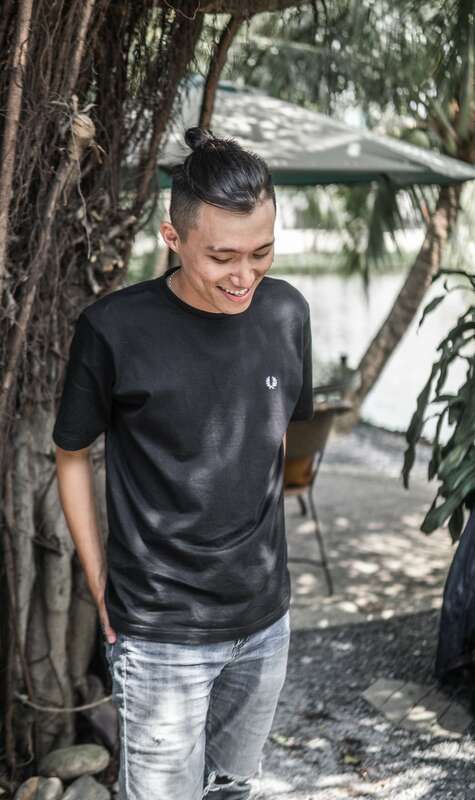 Nguyen Thanh Minh: I would hold my dream festival in Saigon, and there’d be Coldplay, Westlife, The Lumineers, Kodaline, Linkin Park, Oasis, and Mcfly on the bill. And if you weren’t in a band, what would you be doing now? Luke Nguyen Viet Thanh: I would probably be a teacher. Nguyen Thanh Minh: It’s hard to answer, maybe I’d be an engineer.